Why climbing gaffs, spikes, or hooks are not to be used during tree pruning. Climbing gaffs are to be used solely in tree removal or when there is no other safe method to access the canopy. The use of gaffs in tree pruning is harmful to the tree. Gaffs make puncture wounds that are open to the top. 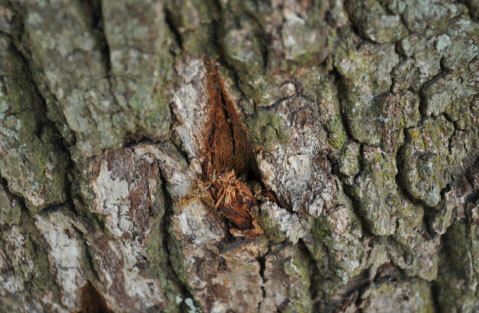 These wounds usually damage not only the bark but the cambium layer of the tree. These wounds catch water, debris, and spores. These wounds can lead to insect infestation or the introduction of fungi that cause decay. Gaffs can also carry disease from tree to tree. A tree service that uses gaffs in tree pruning is either ignorant to, not worried about the health risks to your tree or greedy. Many tree services in our area still use gaffs for tree pruning. A competent climber can access the tree canopy without gaffs. It is a little slower but considering the time that it takes the tree to heal, it is well worth the extra time and energy. I have not encountered a tree yet that had to be pruned with gaffs. We offer educational sessions to garden groups, schools, and certain not for profit groups for free. If you are interested in learning more about proper tree care, please contact Gary by email gary@ickestreeservice.com or by phone at 251-945-5144.